There are two main ways to gain muscle mass. You can either work out with weights in your homegym or at a standard gym, or you can do calisthenics. Calisthenics are essentially a series of movements that are designed to help you build up your muscles. Things like pushups, jumping jacks, and chin ups all fall into this category. This is where the Stamina 1690 Power Tower comes into play. It’s a freestanding unit that’s tall enough to allow you to do a number of different calisthenics-type exercises. I recently purchased one in order to see if it’s as useful as it claims to be. Read on to hear all about my experience, as well as the rest of my complete Stamina 1690 Power Tower review. It almost goes without saying that many people like to work out in their own homegym, rather than pay the fees required to belong to an outside one. I agree since I prefer to work out on my own time. In fact, I’m more likely to do so when I have a bunch of equipment in my homegym space. This is why a power tower comes in handy. I explained how useful this type of equipment is above, as it allows you to a number of different calisthenics exercises. If you are unable to hang a pull-up bar on your wall and don’t have the space or need for a lifting cage, then you need a power tower, such as the Stamina 1690 Power Tower. In my experience, this device is very useful, but more on that later. The Power Tower 1690 by Stamina is considered to be a piece of all in one fitness equipment. This means that you can do a large number of different exercises on it, including things like pull ups, chin ups, dips, vertical knee raises, sit-ups and more. It has a number of different handholds (five in all), all of which are padded with foam to make gripping them more comfortable. You also won’t have to worry about your hands slipping off should they get a little sweaty mid-workout. No Stamina 1690 Power Tower review is complete without a discussion of this piece of equipment’s features. The Power Tower 1690 by Stamina has a steel frame. It can support up to 250 pounds. The bottom of it has non-lip endcaps and feet that not only keep the device in place when you’re working out, but it also prevents it from scratching your floor. 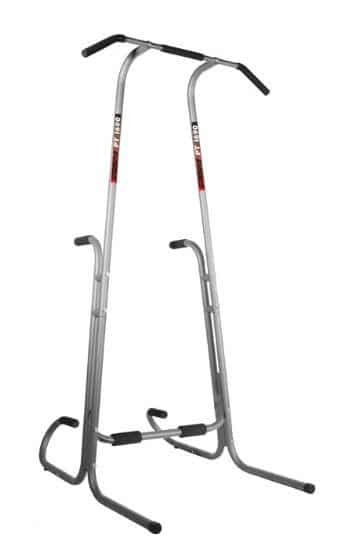 The Stamina 1690 Power Tower comes with five different handholds. These include a push-up station located near the floor and a dual a pull-up station and a chin-up station. Both of those are located at the top of the unit. There is a padded bar with two handholds on either end, allowing you some versatility when it comes to handling these exercises. At the base of the Power Tower 1690 by Stamina, there’s a sit-up station with grips that can be held by either your hands or your feet, depending on the type of ab workout that you’re doing. I already mentioned the push-up station, but this is located near the bottom as well. Finally, in the middle, there’s a triceps dip station that can also be used to do knee raises and similar calisthenics. Overall, the Stamina 1690 Power Tower is 49 inches wide by 42.5 inches deep. It’s 81 inches tall. This means that it’s compact enough to fit into a number of different spaces (although you need to keep in mind that you’ll have to access all sides of it in order to get in a complete workout), while being large enough to handle people of varying heights and weights, up to 250 pounds of course. In addition, the Power Tower 1690 by Stamina comes with two different warranties. The first is a 90-day parts warranty, and the second is a five-year frame warranty. Yes, I understand that “stamina” refers to how long you can sustain a workout without getting winded or exhausted. However, in this case, Stamina refers to the company that makes the Stamina 1690 Power Tower. The Stamina Company has been in business since 1987. They make a range of home fitness products and are proud of the fact that they were one of the first of these companies to develop TV infomercials to sell them. You might have heard of some of their products, as they were endorsed by celebrities like Suzanne Somers. However, the infomercial connection does not mean that Stamina’s products are like their modern-day “as seen on television” equivalents. This is far from the truth. Instead, Stamina makes high-quality home gym products. I was able to do a complete test on the Stamina 1690 Power Tower after purchasing it. This means that I can review it based on my own experience. After receiving the power tower in a flat box, I put it together following the included instructions. This was a little tricky, as there are multiple steps to follow, but everything worked out well. In the end, I had a very sturdy power tower that I placed near a corner of my home gym. I made sure to leave plenty of space around it so that I could use it from all sides. That way, I got in a full workout. For the record, I weigh 160 pounds, so I had no issues completing a series of pull ups, chin ups, sit ups, pushups, and triceps dips. I even threw in some knee raises. Throughout my workout, I noticed that the Stamina didn’t wobble at all. It felt very solid the entire time. It didn’t skid around – in fact, it stayed put. Every aspect of it worked as advertised. Honestly, my experience with this piece of workout equipment was overwhelmingly positive. I have no complaints and highly recommend it to people who want to get in a similar workout. Overall, the Stamina 1690 Power Tower is a great piece of home gym equipment. If you want to do calisthenics in order to build up your muscle mass but hate going to the gym, then this is the best option for you. The Stamina 1690 is very sturdy, can support up to 250 pounds, and is decently compact. While taller people might have issues with the height of the top bar, this is something that can easily be overcome. After testing it out thoroughly, I found that it holds up to its claims. You can purchase your Stamina 1690 Power Tower here.